“Sacred henna designs inspired by the decor of India. Does this item hold the blessing that you are seeking? The henna pattern in each item holds an intention, affirmation and blessing. The dominant henna pattern on this item—Diamonds—represents enlightenment. 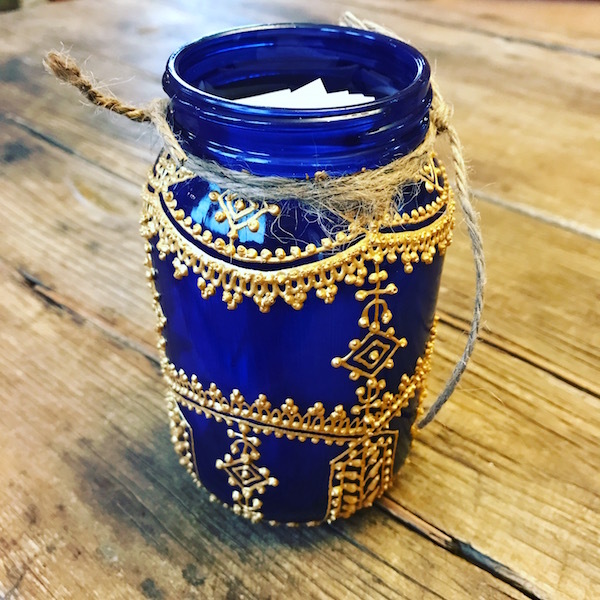 For the last two Christmases my husband has ordered one of these gorgeous jars as a gift for me. I use them as abundance jars, writing notes of gratitude on slips of paper and then putting them into the jars. They are part of my daily yoga and meditation ritual. You can order these in multiple colors, designs, and raised-paint colors. All are gorgeous. 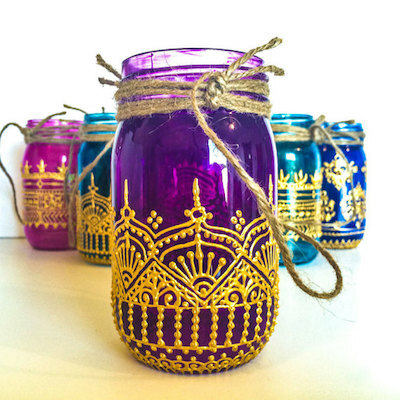 Many people use them as wedding decor; they can be hung as lanterns or placed on tables. They would also be wonderful in a holistic healthcare office. Handmade for you with love, so expect it to take 2-3 weeks to receive your design. Online at MK Connection on Etsy. Required FTC disclosure: I am providing one of these for the giveaway. I was not paid to write this post.